South America’s titi monkey (pictured) is a close relative of the extinct Xenothrix monkey, new research suggests. For nearly 100 years, scientists haven’t been able to agree on the evolutionary origins of a strange, now-extinct monkey that lived and thrived in Jamaica for thousands of years. New research suggests its ancestors arrived from South America, and that life on this tropical island caused the species to acquire its odd set of features. This extinct Jamaican monkey, called Xenothrix mcgregori, was first discovered by scientists in the 1920s, who found traces of its skull and teeth. Other discoveries since then, including more skulls, some leg bones, and bits of jaw, suggested a species of monkey unlike any other known, extinct or extant. Living in Jamaica, Xenothrix did not have to contend with predators. It had weirdly rodent-like legs, relatively few teeth, and a body plan similar to the loris. 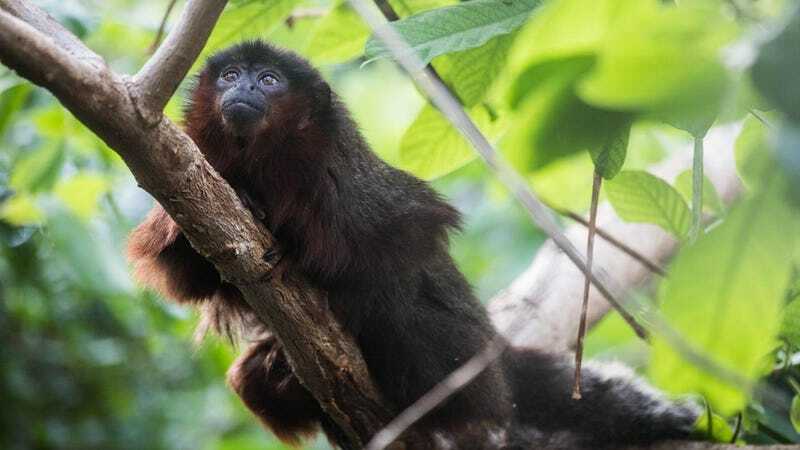 This small monkey was likely a tree-dweller, moving slowly from branch to branch like a shrunken sloth (the researchers compare it in size to a capuchin monkey, which grows only 12 to 22 inches in length). This plethora of odd features led to questions about Xenothrix’s evolutionary roots, with some experts speculating that it came from a unique or unknown branch of ancient New World primates. Scientists, in addition to struggling with its strange morphology, found it difficult to obtain DNA from the bones of these extinct tropical animals; high temperatures and humidity destroys DNA very quickly. Teeth and partial palate of the extinct Jamaican monkey. New research published this week in Proceedings of the National Academy of Sciences is now putting the history of this mysterious primate into clearer focus. Genetic analysis of four Xenothrix specimens found in Jamaican caves suggests it’s closely related to South America’s titi monkey. These creatures likely arrived to Jamaica by clinging to rafts of floating vegetation, the researchers say. This latest study was conducted by scientists from the Zoological Society of London (ZSL), London’s Natural History Museum (NHM), and the American Museum of Natural History in New York. Xenothrix was an “extremely derived titi monkey that underwent major body-plan modifications” after arriving and colonizing their new island environment, the researchers write in the study. “Ancient DNA indicates that the Jamaican monkey is really just a titi monkey with some unusual morphological features, not a wholly distinct branch of New World monkey,” Ross MacPhee, a co-author of the study and a scientist at the American Museum of Natural History’s Mammalogy Department, said in a statement. The deposits from which these samples were recovered date back relatively recently—1,400 to 900 years ago—so these creatures likely lived alongside human settlers. Xenothrix, the researchers say, was likely the last living Caribbean primate. The research team used an established dating technique known as direct accelerator mass spectrometry (AMS) to date the samples. Interestingly, these dates are roughly consistent with the accounts of European settlers who described an unknown monkey-like animal living on the island. Genetic analysis suggests the ancestors of Xenothrix arrived to Jamaica from South America around 11 million years ago during the Late Middle Miocene. DNA evidence also suggests that the ancestors of Xenothrix arrived on the island on multiple occasions. These animals may have clung to rafts of natural vegetation, which were washed out from the mouths of large South American rivers, the researchers say. These ancient monkeys were not the only South American animal to have endured such an aquatic journey. Large extant rodents, called hutias, likely arrived to the Caribbean islands in a similar manner. This study also shows how island environments can influence the evolutionary trajectory of animals in dramatic ways. Islands have produced miniature elephants, “Hobbit” humans, gigantic birds and rats, and, in this case, sloth-like primates. The researchers aren’t sure how or why Xenothrix went extinct, but hunting and loss of habitat likely played a part. As for inferring the exact appearance of Xenothrix, that’s more difficult, owing to the poor fossil record. The researchers say it likely looked like a kinkajou or a night monkey. Today, the still-living titi monkeys are small, tree-dwelling creatures that feature long, soft fur with red, brown, grey, and black coloring. These animals are highly vocal and territorial, and are active during the day. Titi monkeys live up to 12 years, and the fathers often care for the young.